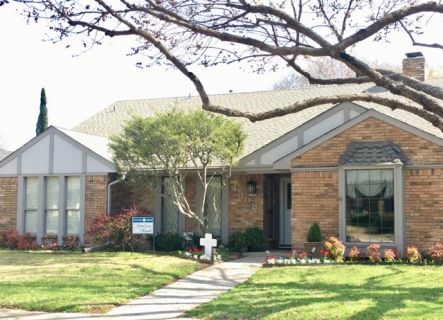 Country Brook was originally established in 1981 and has grown to become a beautiful premier subdivision of 163 custom homes located conveniently in Far North Dallas. Our community is in the city of Dallas, Collin County, and the Plano Independent School District. We are conveniently located near the Dallas North Tollway and the President George Bush Turnpike. With a beautiful park and natural pond in the heart of our neighborhood, our community combines the unexpected peace and quiet of a lake setting with all the conveniences of modern suburbia. Our residents enjoy family picnics and leisurely strolls in our park. We share the pond with ducks, squirrels, herons, and other wildlife. Children and adults alike enjoy spending time out here. This natural beauty within our community helps build a sense of belonging among all those who choose to live here. Country Brook is located within the Plano Independent School District (PISD). Our children attend Mitchell Elementary School, Frankford Middle School, Shepton High School, and Plano West Senior High School. Plano ISD continues to boast one of the highest performances on college entrance exams in the nation. Join your neighbors in cleaning up the pond. Bring yard working tools or just come and help. Every volunteer is appreciated. Click here to email for additional information. The Board meets the 3rd Tuesday of each month. All residents are invited to attend. Please contact the Secretary@countrybrookresidents.com no later than midnight the Sunday before the meeting if you wish to submit an item for the Agenda.